Adding compost to sandy soil increases its ability to hold moisture and buffers pH. 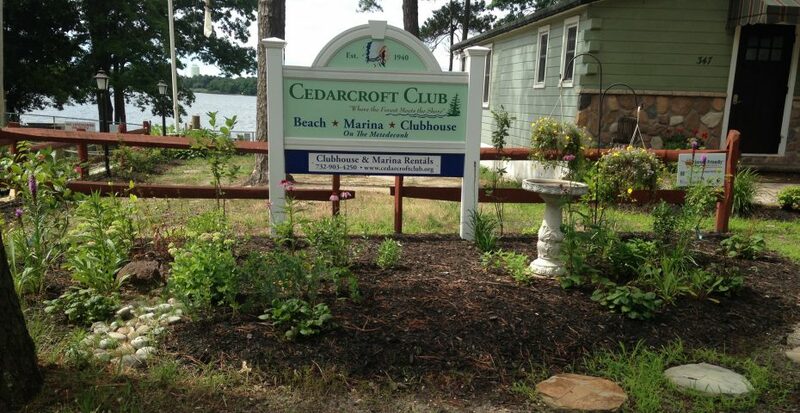 Cedarcroft Club is a shore community bordering the northern shoreline of the Metedeconk River. Two areas were addressed with this project. The front yard of the Clubhouse has sandy soil containing no visible soil organisms, has a slight slope towards the road, lack of vegetative cover, and receives partial sun. Dark colored soil held together by roots is a sign of healthy soil. The shaded substrate around the Cedarcroft Legend Sign near the entrance to the neighborhood is sloped toward the road, the soil contains large aggregates and adequate organic matter. Both sites have fair to good drainage. Existing vegetation on both sites looks healthy. Installed irrigation is not available on either site. Members of Cedarcroft Club made plans to establish a healthy landscape with curb appeal using New Jersey native plants, while developing a showcase garden for community education and access. Project Leaders, Bob Byrne and Andy Jazz, added limestone and potassium to the soil, as per the soil test results and recommendations from the Rutgers Cooperative Extension Soil Laboratory. Compost was also added to the soil to provide organic matter that supports the health of the soil. The landscape incorporates best management practices, requiring little to no water or fertilizer, which will prevent non-point source pollution from entering stormwater runoff, which washes into the Metedeconk River, and eventually into the Barnegat Bay.